One of the biggest challenges I’ve come across since changing my diet has been the struggle to always have ingredients on hand for meals I can eat. Regardless of how carefully I make a meal plan, I always felt like there were one or two meals a week that would throw a monkey wrench in my plans. I want to make this dish that takes an hour, but I only have thirty minutes. I’m ready to cook, but this pepper has an enormous soft spot in it. This curry I’m making requires ginger, but Sarah just used the last of the ginger root in a smoothie. The temptation in these situations is to just run to the grocery store, pick up the item in need, and rush back. The problem with such impromptu runs, though, is that they’re expensive. I burn a gallon of gas getting to the nearest grocery store. When I’m there, I’m often tempted to buy something more than what I intended to buy, which just adds to the expense of the trip. There’s also the time factor. The solution to this problem is simple: have some banked meals on hand. What do I mean by “banked” meals? I simply mean meals that are already prepared or easy enough to prepare that you can pull them out in a pinch and have a finished homecooked meal relatively easily and quickly. I generally separate these into two distinct groups: pre-made meals or extremely simple meals. Here are some examples of each. Pasta with sauce We constantly keep spaghetti and either bottled marinara sauce or the ingredients with which to quickly assemble such a sauce on hand. Often, I’ll just boil some water, add the uncooked pasta and some frozen vegetables to the water, boil the pasta until finished, then drain it and add some pasta sauce straight to the pot. Ten minutes makes a great, healthy supper. 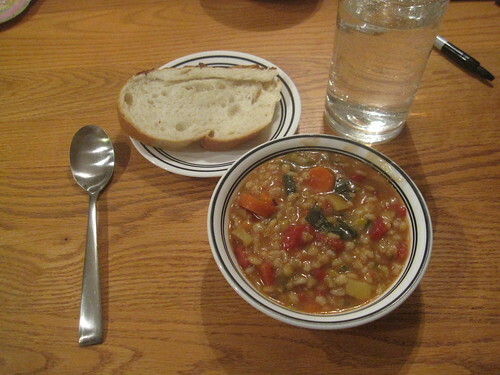 Soup The ingredients of a good vegetable barley soup can almost always be found in our pantry. Sandwiches We’ll often just make sandwiches out of whatever we have on hand. It’s just two pieces of bread with whatever fillings are convenient. The sandwiches are then often grilled or baked in the oven. Burritos Homemade burritos can be made in bulk and frozen, which makes them very easy to grab and microwave for a very quick meal. 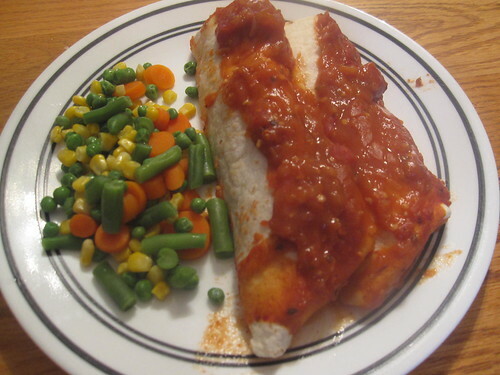 Enchiladas A pan of homemade enchiladas, stowed away in the freezer, can be easily thawed and baked at a moment’s notice for a meal. Casseroles Virtually any casserole recipe can be made in advance and stored in the freezer, ready to just be popped out and tossed into the oven when needed. Just do everything up to the point of cooking it in the oven, then cover it tightly with foil and store it in the freezer. I’ll often make two extra casseroles whenever I make a single one and store the other two for later use. It’s important to remember that the reason for having such things on hand is to make it easier for you to eat at home in a pinch and to avoid unnecessary grocery store trips. Both of these steps are tremendous money savers and key parts of reducing your monthly food budget. Simply having simple spare meals on hand can make a tremendous difference.